From late January to March each year the Al Ain suq has an unusual commodity, date palm pollen. 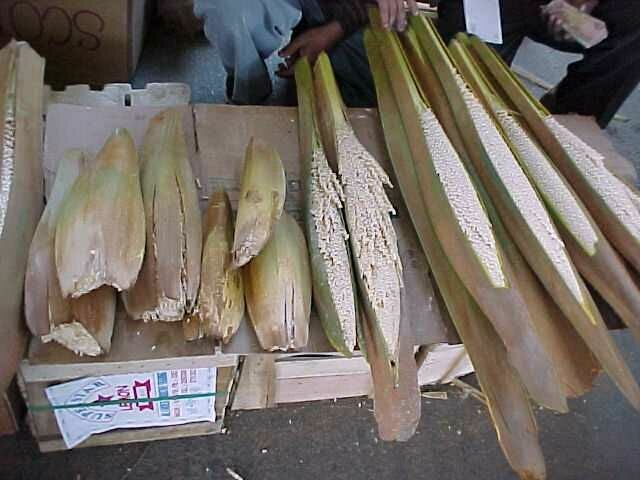 The usual mode of sale is in the form of the whole flower spathe from the male palm. The local name is tal-la and the pollen is nabat. The male palms tend to flower ahead of the female palms, my earliest sighting of a male spathe was on 30/11/2000 but this was unusually early. The spathe is a greenish brown flattened sheath, 30 to 100 cm, long, narrowing at the ends and in some specimens with a substantial bulge in the middle. This protects the date palm flowers as they develop, just as the sepals on a flower protect the petals before they open. Both male and female palms bear these spathes, they appear from the bases of the palm leaves in the crown of the palm. Obviously the female flowers have to be left on the palm to develop. However as most of the date palms in Al Ain are female plants and wind-born pollination is erratic, to ensure a good crop artificial pollination is carried out. This is where the male flowers in the suq come into their own. People with only a few female palms on their land can obtain the pollen to ensure a good crop. The male flower pollen is not affected by being severed from the palm and is still viable. Inside the spathe dozens of spikelets are lined with small male flowers. Traditionally to pollinate a spathe on a female palm, a piece of mature male spikelet is inserted into the female spathe as it splits open and by loosely binding the spathe so that it is not disturbed the flowers on the female spikelets are pollinated. The sale of these male flowers is quite a ritual in the market. It usually entails much questioning and discussion, and the spathe is examined minutely. Often a strip of the covering has been peeled back to expose the spikelets. The spathe is than bound with a piece of date palm frond to prevent it opening further, as it would otherwise quickly deploy into a open brush of spikelets. The unpeeled spathe may be pressed with the thumb and finger whilst listening to the resultant sound, this seems to indicate whether it is ripe for pollination. The exposed flowers may be smelt, they have a sweet scent. The opened spathe can be tapped against the back of the hand to see if it is shedding pollen. However I have noticed that this operation has to be done with a high degree of finesse. Novice salesmen who have inverted the entire spathe and have then given it a solid tap on their hand have been rebuked by experienced buyers. The latter will then give the spathe the lightest tap with their finger and see if a puff of pollen appears. The pollen has to respond to the slightest movement to spread and do its work! This is a timeless ritual. As the season progresses, vendors may have a box or bag of individual dried spikes from the male flower. These are still viable as a pollen source and may be kept until next year to pollinate any early bearing female palms. Again tapping the spikes releases a cloud of pollen. The male flowers are sometimes eaten directly as a fresh vegetable, the pollen is considered to enhance fertility. I cannot report on this supposed effect but they do not have a great deal of flavour. One extraordinary sight in the hot spring of 2000 was the appearance of a second flush of female flowers on a well established palm in the gardens of the Municipality building in Al Ain. This group of bursting spathes appeared about eight to ten weeks after the palm had produced its first crop of flowers. They did not appear to be pollinated and withered and died back. Al Ain members had a "super day" touring Wadi Sabaitnah with Marijcke Jongbloed earlier this month. Ms. Jongbloed is the author of the checklist of UAE flora, copies of which are available to members at a modest cost. A total of 50 plant species were observed (some samples collected) during the Sabaithnah walk. 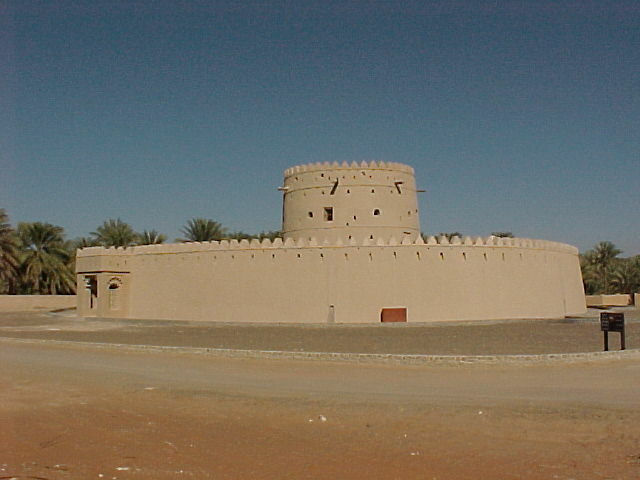 Several falaj watchtowers are still in existence in Al Ain. They are usually located close to the point where the falaj enters the oasis and on high ground. Falaj security was paramount and the towers enabled at least some of the route of the falaj to be watched at times of disturbance whilst still being in touch with the local community. There do not appear to have been towers all along the route of the falaj which could stretch for kilometres. Examples can be found at Hili, Qatarra and Jimi. They are simple round or rectangular towers constructed of mud brick with some use of stone. The entrance was usually at second storey level in common with many other fortified towers in the Emirates. Access was by means of a rope thrown down the side of the tower and toeholds in the tower surface. The Qatarra tower is on the south east corner of the oasis and is unrestored. It is not very high but the top may have eroded and anyway it has a commanding position. There are a number of restored and original mud brick dwellings along the east edge of Qatarra oasis, they are behind the shabiya housing south of Qatarra club. The Jimi tower is also on the south east corner of the oasis and seems to have been restored some time ago. It now has a ground floor entrance but this is not original as the old entrance can still be seen above and to the left. This is a tall tower and is located near the Jimi fort which has also been restored. There are two towers at Hili quite close to each other, tribal rivalry perhaps? They are on the north side of the oasis, the falaj originates to the north of Hili Fun City. One is square the other rectangular, each on its own mound with entrances at ground level facing the oasis. Both have been restored quite recently and the rectangular is occupied by a watchman. They are clearly visible from the east-west dual carriageway which bisects Hili district. Tripod - not always necessary unless you're serious about macro / low light photos. Remember film speed setting (automatically set on most new cameras) can be set to lower ASA / ISO to darken picture - see your manual and tell studio that you've changed it. Most modern cameras meter for average, middle grey. ISO number on film: the lower the number, the more exposure to light. Avoid contrasts in same scene (both sky and shadows) or bracket ( + / -) - see your manual. Keep to film you know works well for you. Use "AE lock" on your SLR (see manual). Meter off a good middle grey area and hold that meter reading by "locking" it. Isolate an area to exclude very bright or dark areas. The hardest challenge is combining sun and shade (NB most desert shadows are lighter than urban ones). "The desert offers one of the greatest extremes in photography", with constant changes of light. Bracket slightly with slides. Approach / "vision"
Most people walk no more than five or six paces from their car to shoot a picture. Vary your position: move around; notice where the sun is; come back at different times / different weather; bring a blanket and lie down; try vertical format as well as horizontal; get there early, fully equipped (check batteries, enough film). www.arab.net Links to the world’s Arab countries.